This article first was published in print and online by Spare Change News on October 19, 2012. “Poor people are not something that we talk about too much or pay much attention to in our world,” Bill McKibben said, sipping a glass of sparkling water to nurse a throat hoarse from a weekend of meetings and rallies. McKibben knows something about poverty. In the early 1980s he helped to start a 15-bed homeless shelter at The Riverside Church on Manhattan’s Upper West Side. He spent several months living in the shelter system himself and wrote about his experiences for The New Yorker in hopes of shocking the public into action. In recent years he stepped out from behind the reporter’s role as an observer and became a leading participant in what he calls the greatest battle the world has ever seen, the fight to halt climate change. 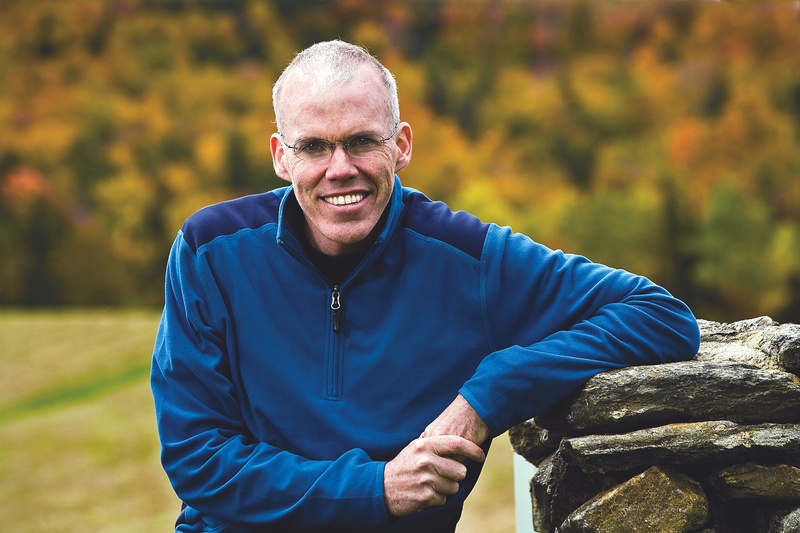 “There’s nothing we’ve figured out how to do that makes life harder for the poorest people on this planet than climate change, and the great irony is that those people have had nothing to do with creating the problem,” McKibben said, hunched over in a rattan chair before a fundraiser at a private home in Newton. He draws a contrast between the industrialized countries that produce the greenhouse gasses linked to climate change and the developing countries that suffer the effects. Rapidly industrializing China contributes more carbon dioxide than any other country, largely because of its population size. With less than a quarter of China’s population, the United States comes in a close second with more carbon emissions than India, Russia, and Japan combined. Americans contribute more carbon dioxide per capita to the atmosphere than most people on the planet, second only to Australians. The developing world has experienced the first effects of climate change, McKibben said, citing outbreaks of dengue fever linked to increasing flooding in Bangladesh, diminished glacial water supplies in Peru, and territorial loss due to sea level rise in the island nation of Maldives. Those countries rank 55th, 61st, and 161st in carbon emissions. He adds that this years’ widespread drought in the United States, which he attributes to climate change and has led to a 50 percent increase in the global price of corn, has directly affected poor families around the world. Later, leaning casually against a wall, with hands thrust deep into his pockets and sneaker-clad feet crossed at the ankles, he addressed a small crowd of about 50 environmental activists, professors, and potential donors. “All over the world, there are people that right now are scrambling around to find enough coins to buy enough corn meal to make dinner for their families tonight,” he told group crowded into the living room and perched on couches, radiators, and the floor. While the scientific community debates what role climate change may or may not have played in the recent drought, a consensus among climatologists are clear that climate change certainly will bring more extreme weather conditions such as drought in years to come. McKibben has been warning of the dangers of climate change since he published his first book, The End of Nature, in 1989. He worries that time is running out. Small changes in lifestyle such installing energy-efficient light bulbs and toting reusable bags to the grocery store will not be sufficient to halt or even slow climate change, he said. McKibben aims to take on oil and gas giants where they will feel it, by going after their stockholders. His latest campaign calls on universities, institutions, and churches to sell their stock holdings in fossil fuel companies, in a collaboration among 350.org, 350 Massachusetts, and The Better Future Project, an environmental advocacy group that seeks a transition to renewable energy. McKibben scoffs at the idea that Americans are addicted to fossil fuels and suggests that the average American would be just as happy to use energy derived from the sun and the wind as from oil, gas, and coal. Instead, he charges that the fossil fuel industry is addicted to huge profits, which it has invested in lobbying against policies favoring a shift from fossil fuels to renewable energy. “They intimidate everybody in Washington. The fossil fuel industry is spending more money on this election than anybody else. Nobody dares offend them and as a result the planet is silently melting,” he said quietly as guests fist started to arrive. Trying to get politicians to listen to concerns about climate change is like waiting on hold for customer service, he later half-joked with the crowd. Listening to the music for 20 minutes is one thing, he said, but after 20 years, it is time to hang up the phone. McKibben and 350.org earned a temporary victory in Washington last year after staging one of the largest acts of civil disobedience in the nation’s history. Police arrested more than 1,200 people surrounding the White House during a 15-day-long protest of Keystone XL, an oil pipeline designed to carry oil drained from the Canadian Tar Sands in Alberta to Texas refineries. President Barack Obama backed off of the project soon after, and The Boston Globe declared McKibben “the man who crushed Keystone XL.” However, both before the event and while addressing the crowd, McKibben voiced suspicion that once the election is out of the way, the President, either Obama or Romney, will push forward with the project. This November, starting the day after the election, McKibben and his supporters will board a bus in Seattle and begin a nationwide tour of 25 cities in 25 days, designed to bring public attention and pressure to his call to universities, churches, and institutions to unload their holdings in fossil fuel companies. McKibben modeled his new campaign after the campaigns of the 1980s that called on organizations to divest from corporations supporting the apartheid government in South Africa. The movement was not widely successful in getting organizations to participate in divestiture, he noted. “But it was everywhere successful in bringing the issue straight to the heart of the discussion,” he added, pointing out that more than 200 colleges and churches around the country did change their investment practices. McKibben reminded the group that the first calls for divestment from the apartheid regime came from the United Nations in the 1960s. It took more than 20 years for that action to gain sustained momentum. He worries that this time, the world might not have that long. “If we don’t do this relatively quickly, in fact quite quickly, then it’s not worth doing, because there won’t be the intact planet to deal with,” he said. Thanks for stopping by my website. My favorite climate change blog is NYT’s DotEarth. In terms of other publications to follow, I just started a new weekly topic watch feature on my site. Each Friday I will select a key topic in science news and cull a selection of links from across the web. Check back frequently for tips on some great articles and some new publications to follow. Thanks for sharing this Rick. Like stiirpuality, politics, food insecurity, and a few other topics, climate change is something I\’ve allowed myself to be silenced about. Not with people I know are of like mind, but with those I sense might not agree, or who might want to debate. The political situation in Wisconsin has brought me out of my shell in the politics area, at least. Hopefully that can translate to other areas as well. I think Stuckey\’s suggestions could help many of us nice Midwestern types transform our involvement and build community awareness about climate change in a way that adds joy and empowerment to our lives rather than more fear.